Corfu, the island of endless natural beauty, the island of song and music,of unending inspiration, a combination of the cosmopolitan and the traditional. The island will leave the visitor with unforgettable memories, excite him with unparalleled images and touch chords in his soul as he pays homage to the culture of the seven islands. How can we put in few words all the elements which make up this earthly paradise, this place which has been so generously blessed by God and which has been written about by so many illustrious writers and poets. 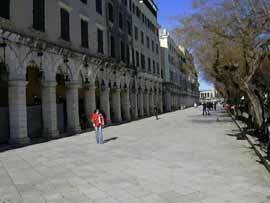 Corfu is the most northernmost and second largest after Cephalonia of the Ionian islands. Its area covers 592 square kilometers and the length of the island is 217 kilometers. It is mountainous with the highest mountain being Mt. Pantokrator (914 meters) but there are several flat areas ,the largest being the Ropa valley. There are two lakes , Korission and Antinioti, and four small rivers often dry in Summer at Potamos, Sidari, Messogghi and Lefkimi. The climate is mild without being bitterly cold in Winter and the Summers are humid. The heavy rainfall and the high humidity encourage the profuse growth of vegetation. Therefore the island has a lot of greenery, even in Summer. 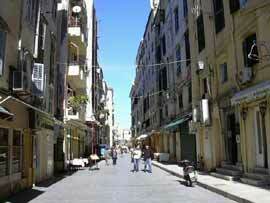 It is the most densely populated area in Greece after thew great urban centers of Athens and Thessalonika. According to the latest census figures, the population of the island is 105.000 with 35.000 people living in the town. The economy of Corfu depends mainly on the tourist industry but there are also related industries and services that depend on tourism. Agricultural production is not large. The chief products are olive oil, wine, vegetables and the unique type of Kumquat fruit. The island takes its name from the nymph Corkira, daughter of the river Assopos with whom Poseidon fell in love and kidnapped, taking her to Corfu. Their union produced Faikas , the first King of the island. He was succeeded by his brother Nausithos who was the father of Alkinos , who played his part in the Odessey. The foreign name Corfu came from the new town that was created in the old fortress on the twin peaks, meaning the town on the peaks. The symbol of Corfu is the abancient warship, the well-known trireme in which to prove their nautical skills the sea men were so exceptional, that they could travel in their ships without a rudder. At the time of Venetian Rule,there was an intellectual Community that kept the seven islands in touch with development in Western Europe. It helped to educate many people in writing and in art. Many Corfiots, having taken their first lessons on the island, continued their education at the main universities of Italy because of its proximity and the influence of Venice. Like all the Greeks who were abroad,Cofriots took an interest in the cultivation of classical studies and took definite steps to help preserve the Greek language. They published in Venice, where aGreek community had formed,writings about the Greek language and its grammatical structure. Ancient Greek classics were translated as well. In the 18th century, literature started to flourish in Corfu with the emergence of the brilliant writers,Eugene Voulgaris (1716-1806) and Nikiforos Theotokis (1731-1800) who were known as the leaders of their generation due to the significance of their work.Voulgaris wrote a work which was published in Lipsia in 1766, and Theotokis offered much to scientific enquiry of the time,writing about physics and mathematics. With the foundation of the Ionian Academy by Gilford, a great admirer of Greece, education in Corfu underwent a dramatic increase as great men came to the island and many gained reputations. At the first Greek University, philosophers and logicians taught, including such men as Petros Vrailas, Armenis, Andreas Moustoxidis, Athanasios Politis, Andreas Idromenos, who left a wealth of literature. At the initiative of Petros Vrailas-Armenis, the first Intellectual Foundation was established, the Education Center in 1836. Dionyssios Solomos, our great national poet, came to Corfu from Zakinthos in 1825 and stayed for the rest of his life,exerting great influence through his personality and his leadership of the intellectual life of the island. At the same time, the other great poet from Zakinthos, Andreas Kalvos (1792-1863) moved to the island and taught at the Ionian University. Following the example of Solomos,Gerassimos Markoras (1826-1911) produced significant poetic works,his best one being the epic lyric poem. The logician Jacob Polilas (1826-1898), another follower of Solomos, left his mark on the culture of the seven islands with major literary criticism and theoretical works. Later at the end of the 19th century there was outstanding work by the students of Jacob Polilas, Dinos Theotokis (1872-1923) and Lorenzo Mavilis (1860-1912). Dinos Theotokis was the first writer to socialistic books about ordinary people into Greek literature. His works include &quot;Honour and Money&quot;,&quot;Slaves and their commitment&quot;, &quot;The condemned&quot;, e.t.c. The poet Mavilis wrote sensual, romantic sonnets about his great love for nature and his homeland. Running parallel to the flourishing of literature was the development of science and fine arts in Corfu. The exceptionally talented sculptor, Pavlos Prossalendis,founded the first Fine Art School in Greece in 1811. He produced many wonderful works,among them the Statue of Adam and the copper bust of Maitland which are situated in the square in front of the Palace of St. Michael and St. George. Painting flourishes when great painters such as Michael Damaskinos and Panagiotis Doxaras come to the island, create and teach. Later make their appearance great Corfiot painters, Angelos Giallinas specialist in aquarelles who studied deeply the Corfiot landscape, and George Samargis with his exquisite portraits. The musical tradition of Corfu harks back to ancient times. Homer refers to the great musician Dimodokos, who entertained Ulysses during his stay on the island of Faikes. \par During the period of Venetian Rule, one of the first lyric theatres of Europe was created, and musical appreciation was developed to a high degree. The great composer Nicholas Mangaros (Mantzaros) wrote the music for the national anthem which was written by the esteemed poet Dionyssios Solomos student and friend of Mangaros (Mantzaros) ,Spiros Xindas,composed for Solomos and Markoras and he created the first Greek operettas which achieved great success in the St. Jaco- co Theatre. Another great internationally acclaimed Corfiot composer Spiros Samaras,wrote the Olympic An- them. He is also known for hies opera &quot;Rea&quot; with lyrics by Costas Palamas. The old Philarmonic Orchestra was founded in 1840 and in 1890 the &quot;Mangaros Philarmonic Group&quot; was formed. Today on the island there are 15 philharmonic bands which perform various tunes for thee litanies and processions which continue the musical tradition of the island. There are also choirs,cantada groups,dance dramas,classical music groups,dance schools,folk music groups,musical and theatrical presentations which reveal the cultural face of contemporary Corfu. That music and song is in the souls of the residents of the island,is plain to see and even appears in the musical cadences of people's speech. People with such a civilized identity as the Corfiots can't possibly not have a plethora of customs that have been built up and kept through the passing of the years. The most important are followed during the carnival period and at Easter in the town,and there are also the traditional festivals with singing and dancing in the villages. The Ionian has been inhabited since prehistoric times and its situation on the trade and invasion routes to and from the Balkans, Italy and the Levant, has insured a rich and varied historical tradition. The first wave of Ancient occupiers of contemporary interest were the Myceneans who have left significant traces particularly in Thesprotia and Kefalonia. 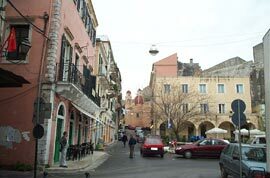 During the Classical period the region was home to several independent city states (and their colonies) remains of which can still be seen particularly in Corfu, Thesprotia and Kefalonia. Later, these states joined one or other of the great leagues organized by Corinth, Athens and Sparta resulting in the Peloponnesian war breaking out off Southern Corfu in 431 BC. During the Hellenistic period the region was repeatedly threatened by Macedonian invasions. King Pyrrhos of Epirus who had already fought the Romans in Southern Italy was one of those to offer resistance until his death in 272 BC. The Romans finally began to occupy the region in 187 BC. When the Emperor Constantine divided the Roman Empire in the 4th century AD the Ionian became part of the Eastern (Byzantine) Empire. Despite this, various parts fell under the control of a number of 6 powerful Frankish and Italian baronial families including the Norman in the llth century and the Angevins in the l3th century. Eventually however, by the late l5th century, two forces had emerged to dominate the region; The Ottoman Turks and the Republic of Venice. Despite brief periods of occupation by the Turks and with the exception of most of Epirus the islands fell under the control of Venice until the latter's defeat by Napoleon in 1797. Then followed a brief period of French occupation of the Ionian islands until, in 1798, a joint Russian Turkish protectorate was established. The Septinsular Republic, as it was called, lasted until the islands were ceded to the French in 1807 by the treaty of Tilsit. The British occupied the islands in 1809 and, following the Congress of Vienna in 1815, set up the Union of the Ionian Islands under their protection. (Septinsular, Eptanissa were the terms used for the seven Ionian islands which included Kythera off the South Western Peloponnese). Following the outbreak of the Greek war of Independence in 1821 which received strong support from the Greeks of the islands, the Turks were gradually driven northward. Britain returned the Ionian Islands to the new Greek State in 1864 but it was not until the end of the first Balkan War in 1913 that Epirus was returned to Greece.